I have been a Yankee fan from birth…that’s 41 years if you’re counting. Growing up as a girl in my house had no bearing on being raised to love them. I have incredibly fond memories of sitting on the couch (with the plastic slip covers, because we are Italian after all) with my father and watching game after game. I remember how my mother would stop in her tracks and watch whenever Bucky Dent got up to bat, because she thought he was so handsome. (Agreed!) I smile when I think back to the many times my dad took my brother and I to the stadium to catch a game…my all-time favorite being Old Timer’s Day, when my Dad would explain something about every single former player that got announced. I remember walking into that stadium holding my Dad’s hand and loving it because you could just feel the history everywhere around you. I remember celebrating the good years in our living room when they would win it all, and the bad years when my father would yell “C’mon for Christ Sakes!” at the tv. It’s like a catalogue in my mind…so yes, I bleed blue! When my husband married me, he wasn’t really a baseball guy. He was much more of a football guy…but marrying me meant learning to love the Yankees, which he did. When my daughter was born, it wasn’t long before she wore a pink Yankee onesie. We even have all of her tiny Jeter jersey’s saved in the attic – year by year, size by size. We brought her to her first game at the age of 3, (because we thought 3 was an age that she would actually enjoy it, which she did!). 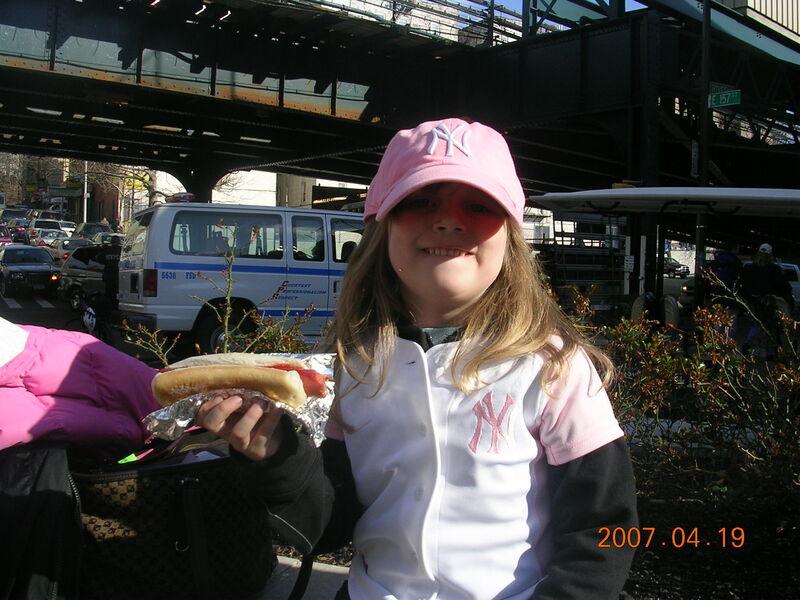 Yankee games are a special part of her childhood too. Thankfully she got to experience the old stadium before they tore it down. (The new one is nice, but it’s just not the same.) We bring her every single year at least once. I wish we could take her more, but that is one ridiculously expensive day. In fact, we are catching a game three weeks from now as my Mother’s Day present. 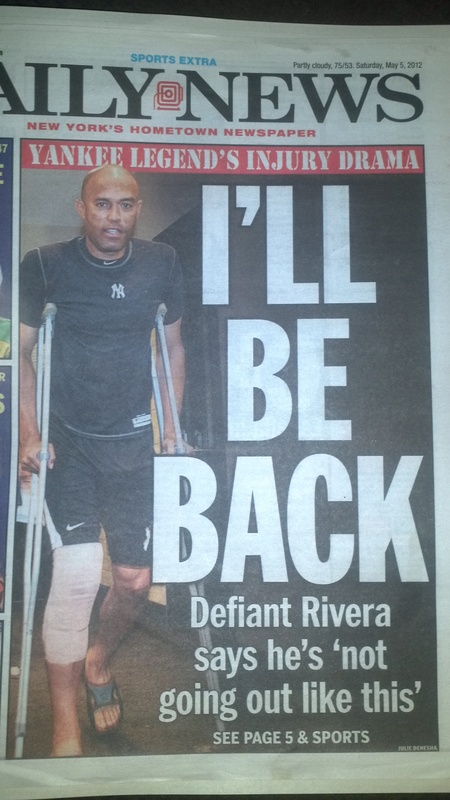 I have been really looking forward to it, but the latest Yankee news has put a little damper on that…Mariano Rivera won’t be there to close. I am not embarrassed to admit that I have felt pretty sad and depressed all day. Right before I went to bed last night, I saw the clip of Mo going down and grimacing in the outfield…and I felt my heart sink. As they carted him off though, he displayed that huge smile that I love, and I figured when I woke up in the morning, they would still say it was just a twisted knee and he’d just be out for a while. When my alarm went off this morning, The first thing I saw on the news was Mo being interviewed with tears in his eyes, and being asked if his torn ACL would be the end of his career. Nooooooo! And Jorge pushing Mo back out onto the mound after save #602 so the crowd could cheer him some more. . The closest I can come to phrasing it is “part frenzy/part serenity”. The frenzy is the whole feeling of the moment. The serenity is knowing that chances are Mo is going to sit them down and close it out. It’s a feeling Yankee fans LOVE, especially this one. The time I have enjoyed it the most was being at the Stadium and watching Rivera shut down the Red Sox in the bottom of the 9th. All I can say is the place went BERSERK and I got to jump up and down with, bear hug, and high five all of the people in the rows around me. 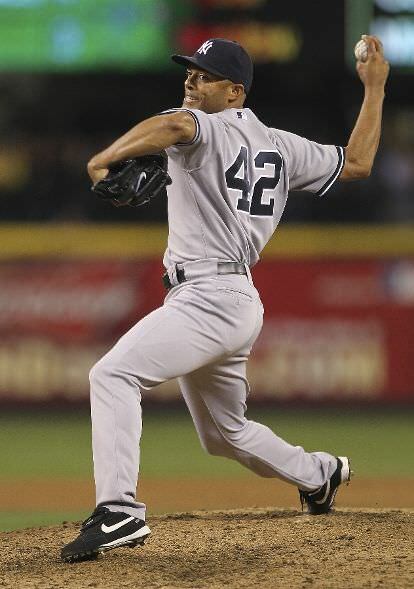 Mariano Rivera creates a magic that you have to physically witness to fully understand. So, now this. I refuse to accept that this is how one of the greatest Yankees ever will end his legendary career. When the season started they interviewed Mo and asked if this year would be it for him. He danced around the question and said he’d reveal his answer at the end of the season. We all knew what that meant though…this year was likely it. I have watched the games this season and tried to picture what it would be like watching games without him…and it made me feel sad. (I’m sure I’m not the only one!) I figured that I would have all year to try to get ready for that. 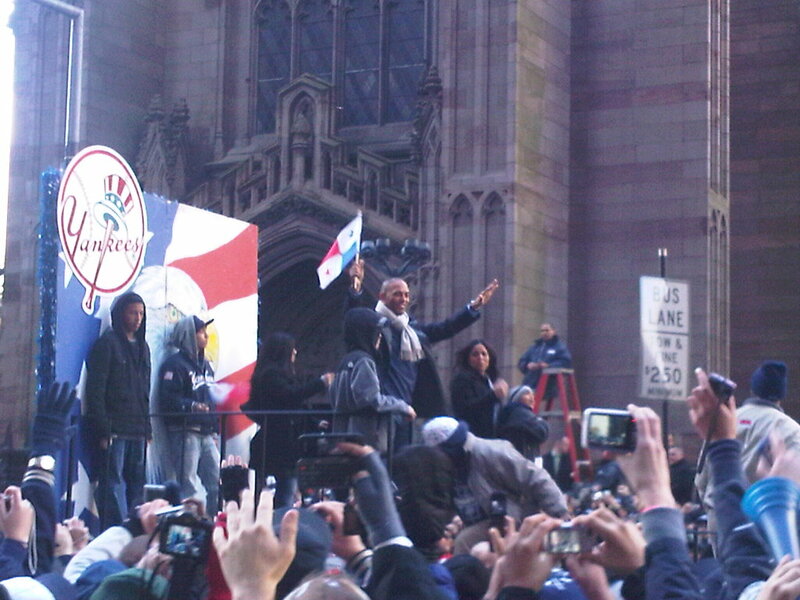 I even tried to picture what his final send off at Yankee Stadium would be like. (Again, it made me feel sad!) Therefore, him being carted off the field with a hurt knee cannot be the storybook ending for a man every Yankee fan idolizes. He has been nothing but clutch and pure class over the years. He deserves better. I pray that he comes back…even if it’s for one more game so us Yankee fans can say thank you and goodbye the right way. Whether it is at home in our living rooms, or live at the Stadium – it’s a moment every Yankee fan wants to be a part of and remember. 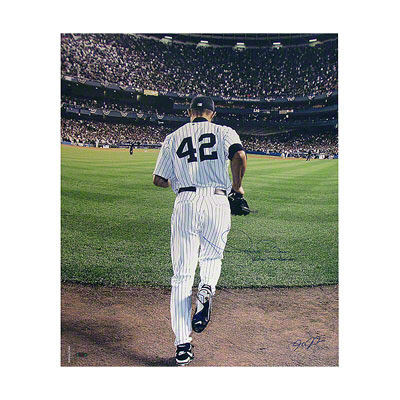 There’s a reason he’s the only man in baseball allowed to wear #42…I just hope I get to hear the opening strains of “Enter Sandman”, and see that magical man jog out of the bullpen to sit them down one more time. We’ll be anxiously awaiting his return!